Whether you like to throw impressive dinner parties or prefer quiet family meals, your dining room furniture doesn’t have to break the bank. At Badcock Home Furniture &more, we offer affordable dining room collections with extra savings that match any style preference. From traditional and formal to sleek and modern to rustic and casual, we have dining rooms on sale to fit any décor and budget. 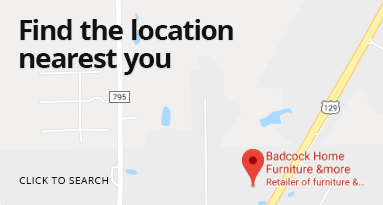 You can browse our dining room sales online, or shop at your local Badcock Home Furniture &more store. Either way, don’t miss out on these amazing dining room deals! Looking to finance that new dining room set you got on sale? We offer easy, in-house financing options. Bring refined style and warm design to your dining area with the Arabella dining collection. Constructed of wood solids and veneers with a sultry dark ash finish, this set offers intricately carved legs, lath back wooden chairs, and upholstered cream cushion seats. Chic fully upholstered cream chairs add the finishing touch to this charming collection. 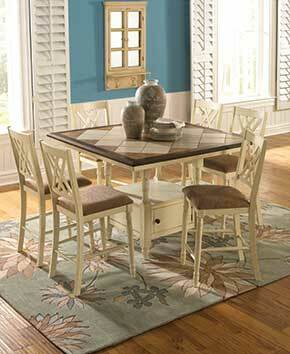 The Garrison Collection dining set brings rustic earth tones to the contemporary dining room. Made from solid acacia wood, which is especially durable, the Garrison Collection is built for a long life and comfort. Table has thick legs that are exposed through the tabletop, adding rustic charm to the durable table. This table is great for small or large parties as it comes with an 18-inch leaf extension. Chairs are sturdy and comfortable with an upholstered seat. Adding to the earthy rustic charm and comfort of these chairs, the chair backs feature a thin ladder design. This set includes the table and 4 chairs. The Peyton Collection is a great choice for a stylish yet casual dining experience. This group is constructed of birch veneers with a beautiful cherry finish. A grooved rectangle table with chunky angled legs comes with an 18” leaf for extra seating for any gathering. Solid constructed chairs add comfort and style with wooden slat backs and black leather-look seats. Plus this suite offers a black leather-look bench. If you’re looking for comfort and style with a warm and welcoming look and feel? This dining suite is for you! This set includes the table and 4 side chairs. Stylish, contemporary and casual, this five-piece dining set offers an ideal setting to enjoy great moments with friends and family. Constructed of Mango solids and featuring upholstered seating and Acacia veneers are among the many highlights of this collection. This collection includes the square counter table & 4 counter chairs. Some of the most important family memories are made over a warm meal at the dining room table. The Trestlewood dining set gives you the space and comfort to make the most of these experiences. Made from 100% solid wood and finished with a classic brown color, this set has a self-storing butterfly leaf and mortise-and-tenon joinery at the base for extra space and added sturdiness. It’s exactly what your family needs to spend quality time together. This set includes the table and 4 chairs.